We all experience ups and downs, but with bipolar disorder, these ups and downs are more severe. 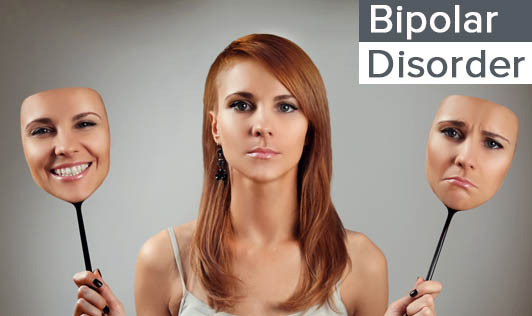 The symptoms of Bipolar disorder can disrupt one's daily life. Bipolar disorder, also known as manic depressive disorder is linked with mood swings that range from the lows of depression to the highs of mania. Bipolar I disorder: The mood swings associated with bipolar I cause significant problems in one's job, school and relationships. The manic episodes can be quite severe and dangerous. Bipolar II disorder: This is less severe than Bipolar I. One may have an elevated mood, irritability as well as changes in functioning. But one can carry on with the normal daily routine. Instead of a full-blown mania, one may have hypomania, which is a less severe form of mania. In this type, the periods of depression last longer than periods of mania. Cyclothymic disorder: This is also known as Cyclothymia and is a mild form of bipolar disorder. In this type, hypomania and depression can be quite disruptive, but the highs and lows are not as intense as they are with other types of bipolar disorders. The causes of bipolar disorder are not completely understood, but it often runs in families. The first manic or depressive episode usually occurs in teenage years or early adulthood. The symptoms may be subtle and quite confusing; hence many people with this disorder are overlooked or misdiagnosed resulting in unnecessary suffering. The symptoms of depression and symptoms of mania or hypomania may occur together and this is known as a "mixed episode." If you or your loved one has any symptoms of depression or mania, seek help from a mental health professional as this disorder doesn't get better on its own!